Adopting 2.4Ghz direct sequence spread spectrum (DSSS) and multiple frequency hopping technology, this receiver has high sensitivity and a strong anti-interference performance. The CPU used in the receiver offers superior resolving power. 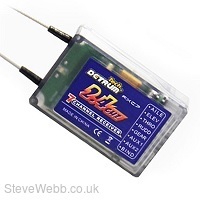 It includes a memory function to easily recognise frequency and ID, and an in-built failsafe function.